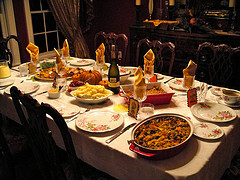 Thanksgiving often means lots of leftovers which can mean a lot of waste. There are ways to use your leftovers to prevent wasting food. Here are some ideas. Turkey leftovers have endless uses. Turkey sandwiches are an easy way to use up some of your turkey, turkey pot pies, turkey tetrazzini, soups, omelets, and even turkey broth from the carcass are great ways to use every part of the turkey. Click here for more options. Turkey also freezes well so you can make these things later if you have had your fair share of turkey for awhile. Mashed potatoes are one of my favorite leftovers. I like to make potato soup with them, I just put them in a pot with some milk (and or broth), seasoning, and cheese. It's yummy and super easy. Mashed potatoes can also go on some casseroles like shepherd's pie. Cranberry sauce is a good leftover for breakfast, put a little cream cheese and cranberry sauce on toast for a yummy breakfast treat. Cranberry sauce is also good on pancakes. I personal also enjoy it on my turkey sandwiches. Rolls can be used for your turkey sandwiches, can be frozen and used with meals at a later time, and can be used with just about any meal. Making pies and other desserts can mean leftover egg whites, click here for some recipes that use just egg whites so you can use them up (they also freeze very well!). Gravy is something I don't care for and not something that saves very well. Anyone have good ideas for this leftover? Veggie leftovers are great for soups, casseroles, and even green smoothies if they are plain. Dessert leftovers are easy, just eat them! Don't let desserts go to waste. If you don't have a sweet tooth like me some desserts can be frozen for another time. Do you have more ideas for leftovers? Share your ideas and recipes in the comments below and together we can help reduce food waste this Thanksgiving. ** This is a Meaningful Memory Post. If you would like to share your greener holiday traditions in a guest post, please email us at greenphoneboothATgmailDOTcom. Leftover gravy can be combined with turkey and leftover dressing/stuffing to make a casserole. It's also a good addition to turkey noodle soup. Boil the carcass. Add gravy, bits of leftover turkey and noodles to the strained broth and simmer until the noodles are done. Season to taste. i agree on adding gravy to soup for extra turkey flavor! I already have some recipes lined up for the leftover turkey. We had to buy a bigger bird than we need for 4 people. One way I manage leftovers on plates that can't be saved is to have a wonderful pre washing device in the form of our dog. He will pretty much eat anything that has gravey on it. So, if we have a ton of gravy leftover I will mix a little with his kibble during the week. Have a great Thanksgiving everyone! Cranberry sauce is also wonderful on oatmeal. Especially oatmeal cooked with spices and some pumpkin puree...delicious. I also plan to way over-make mashed potatoes this year and in addition to potato soup will make Colcannon, where you saute cabbage and onion with the mashed potatoes and plenty of salt and pepper (and butter, if you really want lovely, although you can do without it). And the turkey carcass always goes into the crockpot Thanksgiving night with lots of water to cook happily down into stock. Often after I strain it I'll cook it down even further and freeze it into "bouillon cubes"--really concentrated. I heat the leftover gravy with chopped turkey. When it is boiling, pour it into a casserole dish and top with biscuit dough. Put it in a 450 preheated oven for 15 or 20 minutes for turkey pie. You can add your leftover veg, such as beans, carrots, or corn to the mixture if you wish. I use the mashed potatoes for potato cakes. Mix in an egg, grated hard cheese such as Romano or Parm, crushed garlic, and some bread crumbs if it is not stiff enough. Fry until brown on both sides and cooked through. (Be careful when flipping them, so they stay together.) Top them with sauteed veg and beans for a main dish or serve as a side dish. Either way, they are good topped with fresh parsley. Turkey is a once a year item in our household. Don't get a very big one, it is only 12 1/2 pounds. I always make soup and use most of the dark meat for that, save the big chunks of white meat for sandwiches. Dark meat is not liked at all in my house, my mother usually takes about 1/2 of it home with her. I usually make one batch of turkey enchiladas and that takes care of it all. I make way way lots of mashed potatoes, green bean casserole and stuffing. That is the favorite combo of the children and myself and they go so good together reheated. My husband and mother are the main cranberry sauce eaters. It really keeps well in the fridge so I just set it out on the table every other meal or so and he eats like a relish. Also have frozen it and then got back out at Christmas. Another hint is to have plenty of containers ready to send leftovers home with guests. Don't go digging for them at the last minute...I have them stacked and ready and as we are clearing the table and putting things away folks can pack up what they want to take right then. Once everyone is gone it is just 3 of us left at home now and I want to make sure we are left with a manageable amount. We just got home from a friend's annual Buy Nothing Day potluck - lots of people brought leftovers and we all got to eat things we didn't cook at home. Someone else's leftover stuffing is way more exciting than your own.